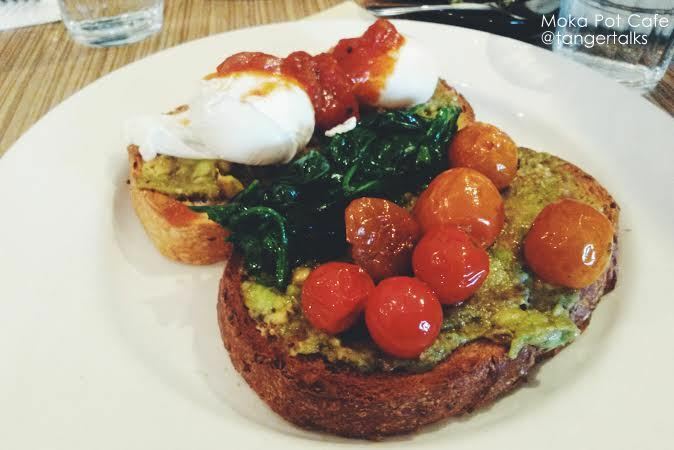 I’ve been to Moka Pot Cafe a few times and each time the food has been quite good. It’s definitely more costly than Aura Cafe but the food is probably just a tad better here – however their service is not (Aura has top notch service, friendly staff members who greet you and check on you once in awhile). I have to say at Moka Pot Cafe it’s been highly disappointing. I really don’t know why because Moka Pot Cafe is generally quite busy and has pretty good reviews on Urbanspoon – it’s a visually appealing place and it just SEEMS like a friendly environment so I get drawn to wanting to go in (it does look inviting from the outside) but the last two times I’ve gone, I haven’t really been greeted at the door, instead slightly ignored. I will continue this line of thought at the end of my blog post since it’s quite long (Don’t read it if you don’t like rants!). For now, moving onto the GOOD stuff – the foooood!!! The last time I came here, I ordered the Egyptian Eggs ( poached eggs, dukkah, spiced pumpkin, caramelised onion, spinach + toasted Turkish pide) and it was SO good. I really enjoyed the combination and they were generous with the amount of pumpkin they gave (cubed pumpkin). The flavours and spices went well together. I remember I thought that it may not be filling without toast but it was just right. I was so tempted to try it again, but decided to go for their Health Kick (though they had this special mushroom dish which sounded pretty good).